South Korean intelligence thinks so but cautions that a test is not imminent. South Korea’s top spy agency, the National Intelligence Service, believes that North Korea is planning for another nuclear test, however, not in the immediate future Yonhap News reports. The assessment came during a closed-door briefing between Seoul’s spy service and South Korean lawmakers. According to a statement made by the office of Lee Chul-woo, a member of the ruling Saenuri Party, the National Intelligence Service came to this conclusion after monitoring activities at North Korea’s main nuclear complex at Nyongbyon. The spy agency neither revealed how it obtained the information, nor went into details about the precise nature of the test preparations. Lee Chul-woo and Shin Kyoung-min, another South Korean lawmaker, merely told local media that the National Intelligence Service is spying on North Korea’s nuclear facilities through “human” and “technological” means. Our assessment is that they have the ability to put a nuclear weapon on a KN-08 [an intercontinental ballistic missile] and shoot it at the homeland. We assess that it’s operational today, and so we practice to go against it. The KN-08, however, has not been flight tested until now, although there have been reports about some ground tests of missile engines occurring. North Korea also did not go ahead with the launch of a long-range rocket purportedly to put a satellite into the orbit. In the past couple of weeks, there have been speculations that North Korea would conduct another nuclear test to commemorate the 70th anniversary of the Workers’ Party of Korea (WPK) on October 10. 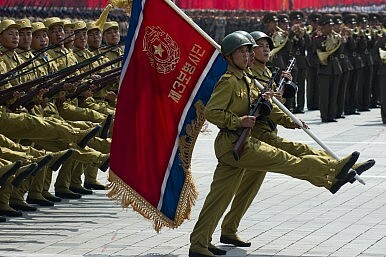 According to Lee Chul-woo, Pyongyang abandoned test preparations due to China’s opposition and technical difficulties. North Korea conducted its last nuclear test in 2013. (Previous tests occurred in 2006 and 2009.) All three tests were preceded by long-range rocket launches. This September, the website 38 North analyzed commercial satellite imagery that shows increased activity at Punggye-ri nuclear test site, the location for the three previous nuclear detonations. “It could be related to anything from maintenance work to preparations for another nuclear test,” the analysis noted. Last month, Pyongyang also announced that that is has upgraded and re-started all of its atomic fuel plants.